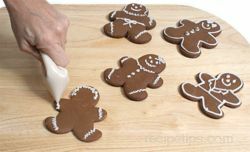 These little gingerbread men are fun for young and old to decorate. 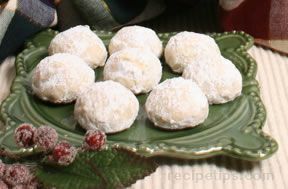 Combine the flour, ginger, cinnamon, cloves, and baking soda in a bowl. Stir with a wire whisk to mix ingredients. Set aside to use later. Cream the brown sugar and butter together in a mixing bowl until fluffy. Beat in the eggs one at a time and then add the molasses. Beat until well incorporated. Add one third of the dry ingredients and beat into the mixture. Add the remaining ingredients, one third at a time. If the dough is getting too stiff when you add the last third, stir it in by hand. Stir only until ingredients are evenly mixed. Divide the dough into two halves. Flatten each half into a thick disk, cover with plastic and chill in the refrigerator for 2 hours. 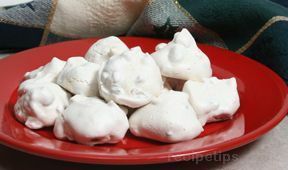 After the dough is chilled, remove one disk from the refrigerator and place it on a floured work surface. Roll the dough out with a lightly floured rolling pin until the dough is 1/8 to 1/4 inch thick. Cut out the cookies with the cookie cutters, cutting the cookies out as close as possible to each other. 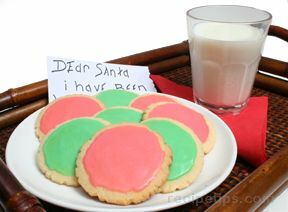 Lift cookies with a spatula and place them on a lightly grease cookie sheet or a sheet lined with parchment paper. Space cookies about 1 inch apart to allow for expansion. 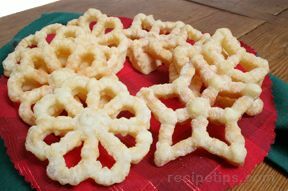 Gather the scrap pieces and roll them out to cut more cookies. Use as little additional flour as possible. Place the cookie sheet in an oven preheated to 350Â°F and bake for 10 minutes or just until the edges start to brown. 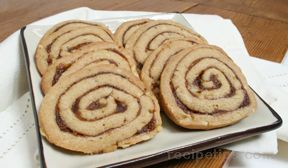 Remove from the oven and allow the cookies to sit on the cookie sheet for about 5 minutes before removing. 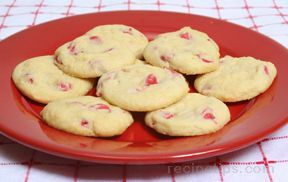 Remove using a spatula to lift them off from the cookie sheet and place them on a cooling rack. 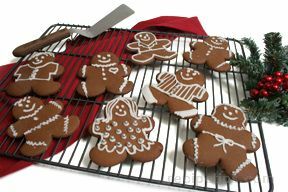 Allow them to cool completely before decorating. Add the remaining half & half one tablespoon at a time. Add the half & half until the frosting is smooth and the desired consistency. You may not need the entire amount of half & half to get desired thickness. 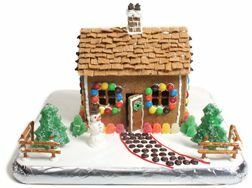 If decorating with different colors of icing, divide the icing into smaller batches and add food coloring to achieve desired colors. 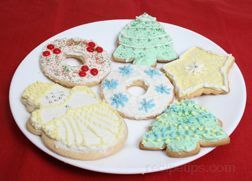 Use a pastry bag to decorate the cookies. If you do not have a pastry bag for decorating, you can use a small bag. Put frosting in one corner and then trim the corner just slightly. 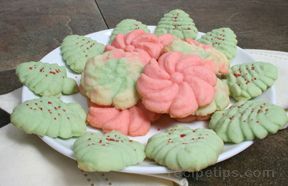 Squeeze the frosting through the hole and decorate the cookies. 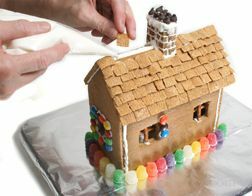 The gingerbread cookies can be decorated in any manner you desire. Allow frosting to harden slightly before storing in an airtight container. 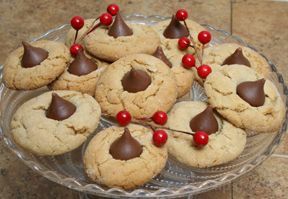 "I just came across this recipe on this site and remembered when I made them last year. 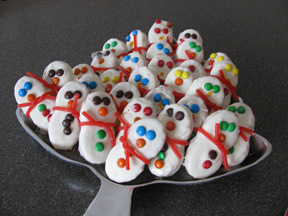 I baked them and then had my grandkids come to help decorate. They had a blast! It was messy but fun to watch them."